Viva La Lengua, Viva La Lengua Libre! The La Lengua Revolutionary Army (LaLeRa) has noted the unprovoked acts of aggression on the part of the San Francisco Association of Realtors to subsume the chosen land of La Lengua into Bernal Heights from the Mission. Viva La Lengua Libre! For Great Justice! La Lengüense, Unite! I agree, I hate when they mess with the maps. This change is goofy. That’s just Lower Bernal Heights™. This is jus as “goofy” as calling our neighborhood “La Lengua”! Por favor que pendejadas!!! 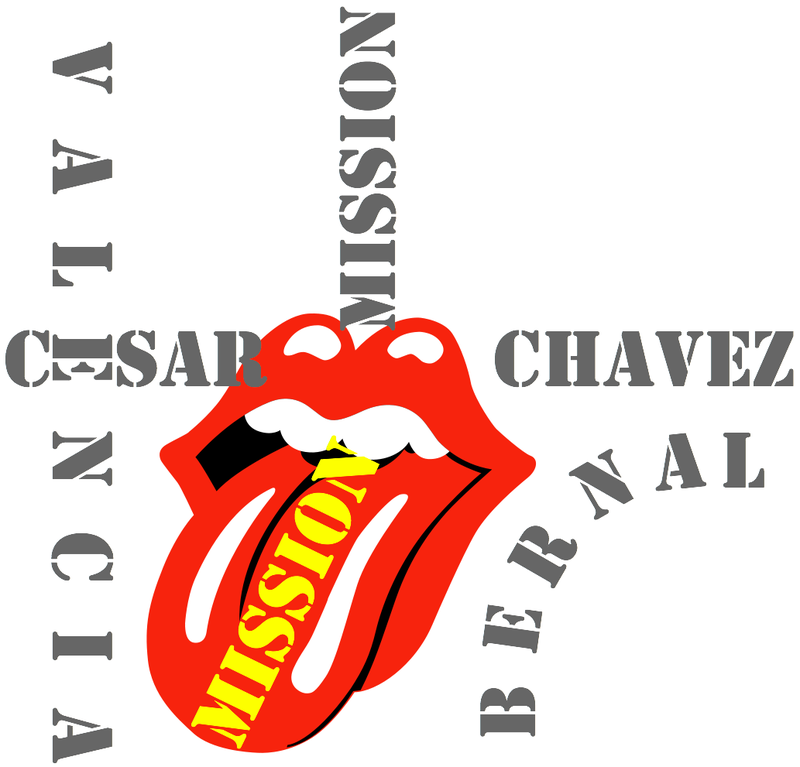 I pretty much call it like i c it but if u insist i’ll play by yur rules…why not call it “the mission”? As far as i’m concerened this is “the mission” and will always b “the mission”. Y the need to always try fix wat isn’t broken? Evr heard the saying “leave well enuf alone”? Alex, I’d like to buy a vowel. And it *is* the Mission, but if you noticed (ntcd? ), they are trying to take it away from the Mission. Okay let me fully spell it out for johnnyo since he seems to have a problem with me…not surprising since johnnyo seems always have a problem with anyone who doesn’t agree with him. It’s seems that you’re the pot calling the kettle black…”they’re trying to take it away from us”, really? Seems someone has already decided to try to take it away from “us” since “they” are now calling it La Lengua. Why the need to be constantly changing what doesn’t need to be changed? Is it that horrible to be a part of the Mission? Well johnnyo did I use enought vowels for you? Are there any mistakes in grammar you’d like to point out? That does seem to be your normal MO. I guess that’s how you keep from actually having to listen to anybody who doesn’t see eye to eye with you. Hi smrod! I know you may find it hard to believe, but we’re on the same page on this one. I’ve always said that La Lengua is part of the Mission – check out the La Lengua microhood link at the top of the page. I like the Mission. It’s why I moved here, and why I resist the evil encroachment of the Noe and Bernal armies of darkness. La Lengua is the thin edge of the wedge. p.s. I think your “anonimo” handle is one of (if not the best) I’ve seen so far here. Seriously, and that’s out of probably 1000 unique people who’ve posted. I was wondering if you’d put 2 and 2 together! What a bright spark you are. But you’re right it doesn’t fit who I am just wanted to give it a try since people on these boards like to give out others info while still hiding behind there wall of anonimity…go figure. Thanks for mentioning your not a native to the Mission it explains everything! I like the way people move to a neighborhood because of its uniqueness than go and try to change everything that makes it unique. But I should expect nothing else, it’s happening all over the Mission. Oh and since you know me I’ll put the same invite I’ve made to others, you ever feel the need to come on over for a chat so i can put a face to the name feel free. Concerned Turkey, well what can I say…I guess it’s all in the name. All banter aside, for now, let me ask you why? I’m truly curious. Why a microhood? Why La Lengua? It’s seems this little patch of land has survived the takeover attempts of “evil forces” so far. Have the “evil” neighbors of Noe and Bernal stepped up their game and the only way to keep them at bay is sick the tongue on them? Nice attitude. My daughter was born here, does she get a voice? Or does legitimacy only come with multiple generation residency? Things change. Ask the Irish, or the Spanish, or the Ohlone. Again the pot calling the kettle black. As for children I have 3 born here too, AND? I don’t have a problem with people voiceing their opinions or with changes. What I do have a problem with is the “anybody not with me is against me” attitude you seem to have. Or the fixing what’s not broken state of mind that seems to be everywhere now. Your not being from here to me does have a bearing on your state of mind. I’ve come across too many people that come to live in the Mission because they like the feel, the vibe of it and then decide they know what’s best for everyone else and start changing what’s “not broken”. Now back to my earlier question, why? I am truly curious to know the reasoning behind this, the need for this. Who knows in the end I may agree with what your doing/saying BUT not about the evils of Noe Valley or Bernal Heights…sorry, don’t swallow that one. In my book there’s evil everywhere with people trying to push there ideals on others not just in the Noe or Bernal areas. I hereby exclude you from La Lengua. No jacket for you. hahahaha, if nothing else your good for a laugh johnnyo. I guess I won’t get any answers as to the why’s but that’s okay…you have a good one johnnyo. I’m beginning to think you don’t actually read before posting comments. But I do find your random inconsistency rather entertaining. You really ought to start your own blog as you have some uniquely fascinating opinions — I believe anonimo.wordpress.com is free. I have no idea why you would think I don’t read the comments before posting since I’m replying to what your saying or why you feel I’m being inconsistant (again just responding to what you’re posting) so why don’t you explain it to me? I thought asking why was pretty valid BUT I guess that’s too much to ask for. HHHHMMMMM, my own blog…nay. I rather enjoy our conversations here on burritojustice, their so enlighting as to how your brain works. That’s too bad on the blog, hope you change your mind. You *do* realize that they are trying to move you out of the Mission into Bernal, right? I need a La Lengüense jacket. I’d also like to propose that San Jose Ave north of 26th be renamed San Jose St, or perhaps have an entirely different name to distinguish it from the four lane highway that merges into Guerrero. You could appeal to tradition and change it back to “El Camino Real”. Or get the expressway section renamed back to “Bernal Avenue” and leave San Jose Avenue (or “Old San Jose Road?”) for the regular street. Let me know when and what you’ll be changing San Francisco to. I’d really like to know what the name of the city I live in ends up being called. Honestly, why the hell does it really matter? but really…calling a little sliver of space La Lengua seems kinda meaningless. Guess what? We’re all just San Francisco. Period. @ rocky’s dady, I can live with that. Seems I’m just a glutton for punishment though and I get tired of all the hulabaloo that’s being thrown around…renaming districts cause it’s catchy, renaming streets cause we don’t want to be associated with “them”, seeing the enemy around every corner, that kind of thing. Hopefully one day I’ll learn to just read these comments, shake my head, sigh, go on with my day and focus on what’s really important. @ everyone, PROUD San Francisco AND Mission native! Make no mistake I don’t question or comment to be a “B” I do it cause this is my home and I love it. Granted there are things that need changing I just don’t think this is important enough to be one of them. @smrod: I hear ya…and I agree. most of it is a lot of hot air..amazing how some like johnnyo get pretty hot under the collar about neighborhood names..and others who attempt to have a “higher” opinion just cause they were born here. Since I was not born here, but been here now for 35 years, I guess my opinion is worth..say…..80% of a natives? whatever, I’m gonna keep talking. Hot under the collar? Really RD? That makes me sad, especially since I’m having fun and smrod/anonimo is taking things so verry seriously. You two are made for each otheAverie down, have a glass of wine and chill. And start a blog. I’d love to read it. LOL..oh, trust me JO,..you get quite passionate and hot under the collar at times..on some issues..so what? we all do…just don’t pretend you are mr cool here all the time, cause you arent. Lighten up. :) don’t be sad. it’s not real life. The Bernal Heights Postal Station has been located in Bernal for years and years. First on 29th Street and in later years on Tiffany Ave. It’s Bernal which is located in the Mission and has been for more years than I can remember. Get over it! We tolerate that small outpost of Bernalian government activity in our midst due to its short lines and utter convenience. Anyway, it’s less “Bernal” that’s the issue than is the “Heights”, which is clearly geographically anomalous. Given the Bernal’s ranchero was in the historical heart of La Lengua, it’s really Bernal Heights that should be renamed! 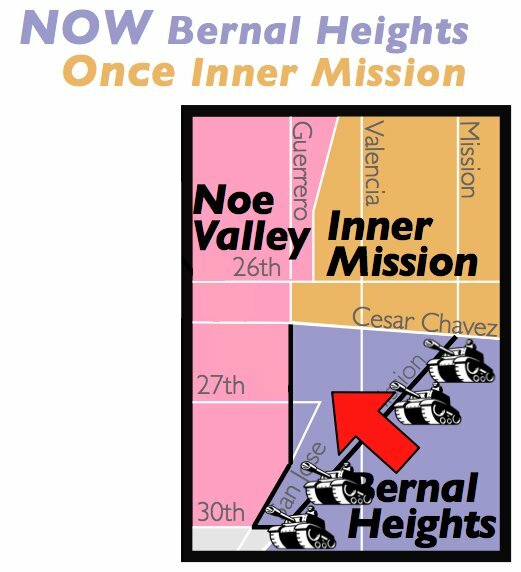 I’m in no way defending any real estate agent or entity – but since that corner of Mission and Cesar Chavez is the location of the former Bernal family’s county at Rancho Rincon de las Salinas y Potrero Viejo…it appears only right and just to continue to consider this Bernal land. Agreed (and I’m sure you’ve seen my El Rio post). I have most issue with the “Heights” describing our hood. Really, it’s Bernal Heights that’s misnamed! So what do we call them? Cortland Hill? Precita Heights? Chert Peaks? Red Rock? As a resident of La Lengua who works in data presentation and is fascinated with SF history and maps, this website is the best ever. Where do i sign up for LaLeRa. Dude, are you my clone? Yo, johnnyO: I see what you’re saying and I agree. My neighbors who have been living in Bernal decades longer than I have been simply call it Bernal (but they pronounce it in Spanish, not the Gringo way). I.E, Bernal doesn’t rhyme with kernel.